The story of a warrior caught in a time warp – Veer! A period romance with no history to follow or flout, Veer works in parts at a surprisingly emotional level. The Pindaris, let by Dadda Mithun Chakraborty, are betrayed by the Raja of Madhavgarh (played by Jackie Shroff), who is hand in glove with the British and traps and kills many of them! Eternal enmity is sworn as Mithun manages to hack off the Raja’s hand. Cut to two sons being born to Mithun and growing up to be Salman and Sohail. Why oh why does Sohail have to be the spoiler in every Salman film? He is even less funny than Uday Chopra and should be selling cars, or even worse, car insurance. The boys are rowdies and in a Pindari raid on a train Veer, Salman, meets the princess of Madhavgarh, Zarine Khan, and their eyes meet. Need we say more? A romance is about to brew. The boys are sent to England to become gentlemen and think like the British. There Veer discovers that Yashodhara is the princess of Madhavgarh and yet continues to pursue her despite being ridiculed by her brother. The Yuvraaj dies in an encounter with Veer and the boys return home. Now we have to get Veer and Yashodhara together despite the Montague and Capulet type set up and also to determine exactly how the conflict between the Pindaris and the Raja of Madhavgarh will be sorted out. The more bloodthirsty would no doubt like an epic battle that ends in the supremacy of the Pindaris. But what we get is a surprisingly benign solution from the maker of Gadar. We see the birth of a nationalistic hero as the Rajputs realize that their is a common enemy – the British! To keep the bloodthirsty somewhat satisfied there is a hand to hand combat in front of the assembled armies! Was this the doing of the story-writer Salman or a change in stance from the maker of Gadar, we will never know. But I found this ending quite satisfying and one that lifted up this fictional historical. Everything says this film should NOT WORK! A period drama relies on costumes and period setting. Here we have a major costume debacle and something for everyone, all the way from leather chaps and plastic breastplates, to loosely wrapped turbans and chunky jewelry on the men. Salman sports orange pants with leather knee patches, to scruffy Tarus Bulba costumes, to suave suits and hats, and just as in Wanted, his hairstyle and hair length changes from scene to scene in a mind-boggling flouting of continuity. The leading lady looks surprisingly decent in Indian dress and an atrocity in western garb and yet she is shown in mostly western garb. This is a poor research effort on the part of the costume designers as I doubt Indian princesses were in Western garb even in England. 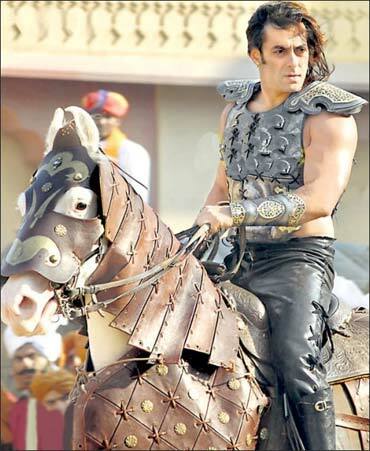 In the cast we have Salman, who tries so damn hard after so long, you cannot help but be drawn into the story of Veer. Mithun rocks as the father, and Jackie is decent as suave though evil Raja of Madhavgarh. The mother is played by Neena Gupta who seems to still be in Choli ke Peeche mode! The crown prince reminds me of Raj Kumar with the chiseled nostrils and narrow lips – all we needed was a few “Jaani” dialogs from him. Sohail reminds me of the slow buffoon in a Monty Python film – his attempts at comedy include dialogs like “Yeh England bhi kya kamal Jagah hai, yahaan sabko Angrezi aati hai! !” The new girl Zarine Khan is stately in Indian costume, and passable in effort. The bits with her in British schoolgirl garb in London smack so much of Lucky No Time for Love that it drags the film down. But strangely there are also moments that lift the film up in that same song Meherbaniyan. The entire film is a curious mix of things that work and do not. The dialogs are quite silly in places and the accents all over the place and inexplicable. Salman quotes George Bernard Shaw when the teacher suddenly starts talking to him in his poorly accented Hindi! When Salman says – “Todna agar jodne se juda ho toh kya use todna kehte hain?” the heroine is as mystified as the rest of us, maybe purpose was to baffle her into dancing with a commoner! And in other places the dialogs are strangely effective – like Mithun saying Zuban se diya hua vachan, aur kaman se nikla teer kabhi wapas nahin aate! How does a son end a letter to his Dad with Ashirwad? Shouldn’t it be pranam? There is a curious mix of childishness and portly-ness in the lading lady – but she is not entirely without charm though she does not have much to do. And the song Surli Ankhiyon waale is so grossly overused you begin to hate this gem by the time the film ends. The musical brooch is another painfully recurring theme. But despite these detractions Veer is still engaging at some level because of the romance that works, the patriotism that is so nascent and yet effective, unlike the LOUD effort we usually see in films, and Sajid-Wajid songs (penned by Gulzar with outstanding lyrics) are strangely well picturized and well mounted. I think this one has no pretensions about being more than it is, and it works well at being what it wants to be. See it one time for sure.